A Midterm Chat is a feedback process through which instructors gain insights into their students’ experiences in a particular class during a particular quarter. The process generally takes place during a class session between the 4th and 6th week of the quarter, allowing time for the instructor to institute any changes deemed important as a result of insights gained. In contrast to end-of-term student course evaluations, feedback from this process is rich, detailed, and constructive in helping to determine specific steps to improve student learning. Students experience an in-depth individual reflection and the group discussion about their learning, which helps them be more aware of their learning process. Students also see tangible evidence that you, the instructor, are working to help them to be successful by seeking and responding to their input on their learning. CTLT has conducted more than two dozen at Cal Poly, and not only have faculty indicated high levels of satisfaction with the feedback, their students’ responses in every case has been very positive. At the initial meeting, held before the chat itself, you meet with the CTLT staff member to describe your course, your students, and your teaching approach/instructional goals. This provides important context for the chat. a. What aspects of this class support your learning? b.What aspects hinder your learning? c. What suggestions can you offer that would enhance your learning? d. What can you (students) do to improve your learning? Students initially reflect and make notes individually, and then discuss their ideas in small groups followed by groups reporting out to the whole group. The consultant records the feedback on a file (powerpoint/keynote slide) visible to the entire class, checking for accuracy, completeness, and levels of consensus/dissensus. The consultant converts the raw notes into a letter summarizing the student feedback. At our follow-up meeting, we provide you the letter and answer any questions you might have about the process or the content. At this point, we can also help you reflect on the feedback, connect you to resources and ideas, and then support you as you implement your choices about how you wish to respond. For best results, you will want to follow-up to discuss the feedback with your students, including what you learned, what changes you will make (and why) and what you cannot/will not do (and why). Research demonstrates that this response is crucial in improving student engagement, motivation, and learning in the class. A nice by-product is that this meeting CAN improve end-of-term instructor ratings as well. Voluntary: We only conduct chats at the direct request of instructors. Contact CTLT (756-7002) with questions. 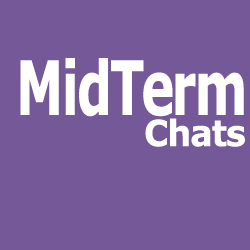 Use the link below to schedule a Midterm Chat.